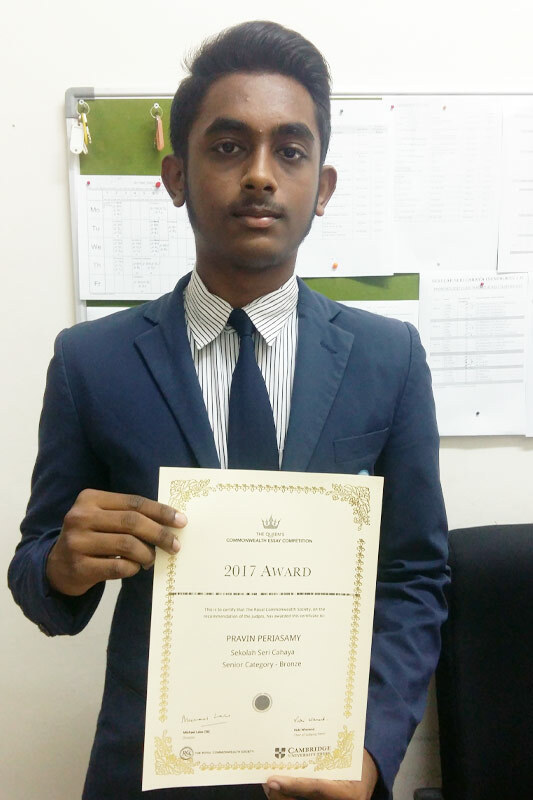 Recently, R.E.A.L Schools, Shah Alam Campus student Pravin Periasamy proudly clinched the Bronze Award in the world’s oldest international schools writing competition, the prestigious Queen’s Commonwealth Essay Writing Competition. Organized in partnership with Cambridge University Press, this annual competition is open to all Commonwealth citizens under the age of 18 years and offers young writers from all walks of life an opportunity to voice their opinions and discuss significant Commonwealth and global issues from their perspective. It also aims to develop critical thinking and creative skills through writing. Boasting a remarkable list of previous winners that include names such as author Elspeth Huxley, Pulitzer Prize-winning journalist Mei Fong, and former Prime Minister of Singapore Lee Hsien Loong; this year saw the participation of over 12,300 young talents from the five regions of the Commonwealth. As a budding wordsmith, Pravin has now joined that illustrious cast. His talent of weaving words into captivating stories certainly bore fruit when his essay entitled “What is the cost of peace?” was selected to win the Bronze Award at this year’s competition. In an excerpt from his essay, the Senior 3 student questions the cost of peace and provokes the idea of peace by stating, “The cost of peace foretells the ending of civilization itself. The cost of peace has left other questions to rise above too”. R.E.A.L Schools’ effort to always provide students with platforms and opportunities to not only put their critical thinking and creativity on display but also to improve and showcase their writing skills, has resulted in the development of more well-rounded students. Pravin’s achievement continues R.E.A.L Schools’ fine tradition of producing talented writers and it is hoped that his success would spur and encourage more students to write and pen down their thoughts and ideas. The post R.E.A.L Student Bags Bronze at International Writing Competition appeared first on best international schools in malaysia.